The author was first admitted to Claybury asylum aged sixteen in 1975, just after his mother had been institutionalised. She died two years later. He spent a decade in asylums, halfway houses, therapeutic communities, dosshouses, squats, and on the streets. 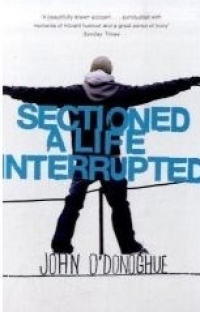 Sectioned is his raw, powerful and moving story of survival against the odds. It is also the story of a man’s coming of age in a Britain that was changing forever. Sold at auction to Eleanor Birne at John Murray in June 2007. Winner of the MIND Book of the Year. The humdrum reality of mental illness has rarely been so well conveyed. It's less a story of locked wards than of hostels, soup kitchens, sheltered housing, drug addicts, well-meaning charity workers and relentless poverty. O'Donoghue is honest about his own failings... What saves him, in part, is poetry: he begins to write as a teenager and through most of his ordeals he keeps it up. Sectioned is too hard-edged for verse but it's a triumph that it exists at all and a vindication of O'Donoghue's faith: psychosis could easily have killed him, or the liquid cosh stunned him into silence, but here he is, against the odds, speaking loud and plain. ...O'Donoghue's gift for spinning compelling yarns lifts this material out of the suffering-saga-tag remainders bin. Sectioned should be compulsory reading for anyone working in the mental health system: they'll laugh, they'll cry, they'll think twice before using ECT.